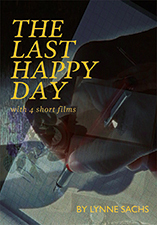 THE LAST HAPPY DAY is an experimental documentary portrait of Sandor Lenard, a Hungarian medical doctor and a distant cousin of filmmaker Lynne Sachs. In 1938 Lenard, a writer with a Jewish background, fled the Nazis to a safe haven in Rome. Shortly thereafter, the U.S. Army Graves Registration Service hired Lenard to reconstruct the bones-small and large-of dead American soldiers. Eventually he found himself in remotest Brazil where he embarked on the translation of A. A. Milne's classic children's book, Winnie the Pooh, into Latin, an eccentric task that catapulted him to brief world-wide fame. Sachs' essay film uses personal letters, abstracted war imagery, home movies, interviews, and a children's performance to create an intimate meditation on the destructive power of war.